Jorge Perez of Related Group is finishing close-out now on Paraiso Bay, one of four towers, in the Paraiso development in Edgewater. 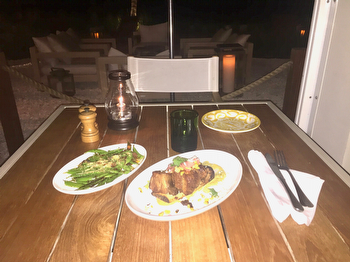 At the heart of the luxury development you will find Amara, "The Quintessential Miami waterfront restaurant" from James Beard Award-winning Chef and restaurateur, Michael Schwartz.https://amaraatparaiso.com. I consider myself a food snob and gave Amara a shot tonight. I will return often to try more dishes and confidentally share this postive experience with family and friends. Ambiance- 9.2 Amara fits seamlessly into the Paraiso development and the bay. The main dining room is warm and inviting complimented nicely by a well appointed bar at one end and an open kitchen with open flame at the other. My favoriate tables are on the patio. Diners on the patio enjoy panoramic bay views in an intimate, yet relaxing envornment. There is also room to lounge both at the foot of the deck and on the second floor indoor-outdoor lounge. Service- 8.7 The wait staff is attentive, relaxed, knowledgeable, and does a nice job explaining the menu options and making reccomendations. Food Taste and Presentation- 9.4 I chose the grilled beef short rib with creamed corn, pickled onion, and queso fresco for my entree; the charred snap peas vegatable side; and the chocolate torte for dessert. Each plate of food was served with an appealing presentation and brought complimentary flavors to the meal in the correct portion size. The meat was fall-off-the-bone tender and flavored to perfection. The torte was decadent and combined the right amount of richness and chocolate sweentess atop a nicely crisped crumb type crust. My only negative comment to the chef's team: remove and discard the stem end and string from each snap pea pod moving forward.